The SeaBoard was a wooden tug that work Boston Harbor her whole life... from 1921 to 1962. Her principle job was to help move ships in and out of the harbor but on many occasions also did fire fighting duty. We salvaged many artifacts from her before she was retired. This plaque contains two gauges that monitored the water pressure used for the water cannons. 1. 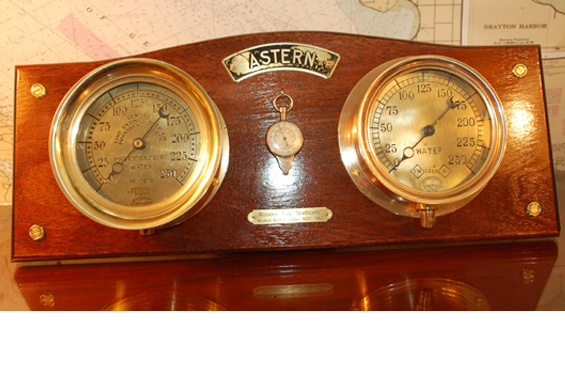 The "American" gauge on the left is dated 1918 and is constructed entirely of "yellow" brass. 2. The "American" gauge on the right is dated 1928 and is constructed entirely of the rare "red" brass (this must have been a replacement). 3. 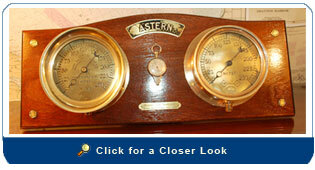 The brass "Astern" plaque was used in the wheelhouse to indicate the direction of the engine power. 4. The chart measurer/compass was found in the wheelhouse and was used to measure distances on inland waterways (statute miles are used to measure distance because of the curves). The gauges were buffed and sealed with a clear brass lacquer. The mounting board is solid mahogany with four coats of hand rubbed spar varnish. Size: The plaque measures 20” long and 8 ½” high.